The reasons for selecting recycled office furniture over new are numerous; environmental core values, LEED certification, lower operating costs, positive publicity, employee recruiting and retention to name a few. At EthoSource, we are sincere about being green minded, and take pride in helping many of our customers achieve LEED certification by implementing our recycled office furniture solutions. Sustainable office furniture, at its core, has to do with protecting and preserving the earth’s resources and recycled office furniture is the “platinum” standard for green commercial interiors. Eco-friendly office furniture uses little to no additional raw materials, a fraction of the energy and significantly less labor, making it the perfect fit for any company pursuing green initiatives and/or the U.S. Green Building Council’s LEED certification. 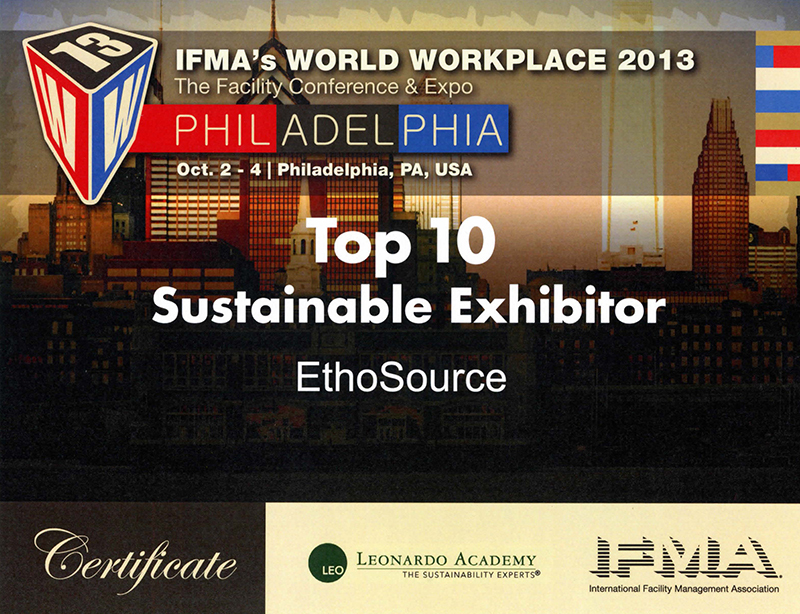 EthoSource is a proud recipient of the IFMA World Workplace 2013 Top 10 Sustainable Exhibitor Award.